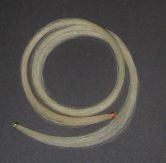 Siberian White Stallion Bow Hair---One Pound--32 inch--Enough to re-hair 60 to 70 Violin Bows. Horn Bow Hair Comb. Combing bow hair while rehairing helps keep it straight and parallel. Precisely crafted of natural horn. Over all length 90 mm. Toothed part width 40mm. Hair Gauge used for measuring a given hank of hair--used in re-hairing bows. Graduation scale for measuring the precise amount of hair, Violin, Viola, Cello, Bass. Dull finished stainless steel. Violin Ebony Bow Frog full size, half lined. Thread for tying the ends of the Bow Hair when re-hairing bows. 300 meter Roll, enough to do many-many tyings. Not exactly as shown in picture. Violin Bow Grip- Rubber, easy to install--remove frog and slide onto bow. Note: Bow in photo not included. Bow Winding--German Silver Wire--0.30mm X 100 Gram Roll. Note: German Silver: Alloys of Copper, Zinc and Nickel. German Silver is not Sterling Silver. According to our suppler you need approx. 3 to 5 Grams for a violin bow--100 gram roll you can do 20 to 25 Violin Bows. Nicely finished black thumb grip & lapping leather, 2 pieces. For Violin Bows. NOTE; We do have a few in Brown color if you wish. Bone with ebony underlay, polished.--Violin. Portective plastic sleeve type bow bag, use for putting customers bows into after rehairing or use for protection when shipping etc. Priced each @ .49 Cents each or $49.00 per one hundred. Bow Frog Slide--Mother of pearl mounted on ebony. Violin full size 4/4 bow frog. Siberian-Finest-Stallion--unbleached white horse hair, select quality, Violin-heavy hank. One hank will do one bow--31 inch in length. Depending on the bow--2 hanks may do 3 bows. You may Purchase our Bow Hair by the dozen--a great saving at $13.50 each for a total of $162.00 per dozen. These are packaged by the dozen from our supplier. Finest Madagascar ebony, half lined silver colored mounted with pearl eye. Violin Size: 4/4. Made in Germany. Finest Madagascar ebony, full lined silver colored mounted with Parisian eye, divided button, beautiful finish. Violin Size 4/4. Made in Germany. Ebony Bow Frog, Fully lined with double eye, Violin Size: 4/4. Wooden; frog wedge, bow tip block, frog block, these pre-cut blocks and wedges save time when rehairing bows. Price is for one dozen. When shipping we send 4 of each, unless you specify otherwise. Used for Violin Bow Frogs. Bow frog screw eyelet-brass. Inch Thread. (fits into bow frog for threading screw) For Full size 4/4 Violin Bow Frogs. Brass Eyelet for Violin Bow Frog---MM Thread. Nickel Silver (German Silver)--Polished. For Violin full size 4/4 Bow Frogs. Frog Top Lining, Octagon shape, goes between frog and stick--Silver colored. For full size 4/4 Violin bow frogs. German silver wire, 0.30 mm x 300 gram roll. For Violin, Viola, Cello and Bass Bows. Enough to do many bows. Note: German Silver: Alloys of Copper, Zinc and Nickel. This is not Sterling Silver. According to our supplier you need 3 to 5 grams for one Violin Bow, Therefore you can do approx. 60 to 75 Violin Bows with a 300 gram roll. Thumb Grip---Black and white, plastic. For Violin full size 4/4 Bows, however, can be used on other size bows. A very nice standard weight Carbon Fiber Bow by Stannton at a afordable price. Round with Ebony fully lined frog with doube eye, black colored shaft, Natural White Mongolian Horse Hair. Very durable, will not warp. Many players are using Carbon Fiber Bows, due to their stiffness and densidy they produce a very good sound. Weight Approx 61 Grams--Violin Full Size 4/4. A professional quality Carbon Fiber Violin Bow--imitation wood color. Quality white horse hair, fully lined frog, three part button, Parisian eye, nice playing weight of 61 grams, very well balanced. Carbon Fiber bows are designed to produce very good tone and playing ability. Violin Full size 4/4. P & H Quality White horse hair ready to use for P & H London Bows, bonded at each end. Violin Sizes: 3/4 and Full Size 4/4. Instructions included for easy Installation--For P & H London Bows only. We do not sell these Bows, however we do have customers for this type of Hair. Hidersine Light colored rosin, Made in England, old stand by for years. Tonica, non-allergenic--very good Rosin--made in Germany by Pirastro. Easy to use applicator with cloth cover. Rosin in powered form, Large Three (3) Ounce size -----Great to use when re-hairing bows. D'Addario light colored quality Rosin, made with all natural ingredients, can be used on all bows. D'Addario dark colored quality Rosin, all natural ingredients, can be used on all bows. 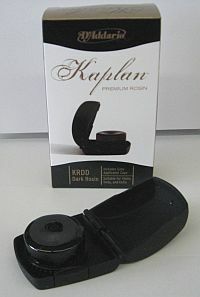 Kaplan Premium Dark Rosin with case, formulated using the original Kaplan recipe, which produces less dust, helping to keep the instrument cleaner. The rosin is packed in an attractive case, desighed for easy one handed use. Kaplan Premium Quality Rosin--Light--Suitable for Violin, Viola and Cello with easy applicator. Special Kaplan recipe produces less dust to keep the instrument cleaner and also rosin rotates in case for uniform wear. One of the world's finest light rosin, harder than dark rosin and great for summer use. Hand made in Greece. Same product as MR500 only light colored for seasonal use. Fine Dark Rosin. Musicians all over the world confirm this rosin to be an outstanding product. This rosin gives full-smooth quality sound, when playing in an orchestra or solo concerts. We have tested this Rosin in our shop and have found it feels great with good bite and produces a mellow sound. Dark, made in England. 20 gram cake. This is an old stand by for many years and to this day our best seller. Fine quality rosin used by many professional players. Made in Germany by Pirastro.